1 of 3 In a small bowl, stir together flour and 1 tablespoon water; set aside. 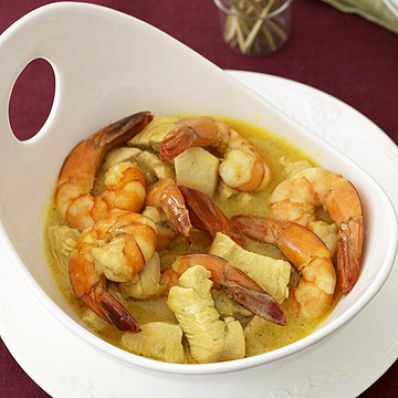 2 of 3 In a medium-size saucepan, whisk together coconut milk, vegetable broth, ginger, lemon juice, curry powder, black pepper, garlic powder and salt. Bring to a boil over medium-high heat and cook for 10 minutes, until reduced. 3 of 3 Add chicken to saucepan and cook 2 minutes. Stir flour mixture and shrimp into pot and cook for 2 minutes or until shrimp is cooked through and liquid has thickened. Serve warm.